In 4-quart saucepan, heat oil over medium heat. Add shallots, sage and red pepper flakes; cook 3 to 4 minutes, stirring occasionally, until shallots are tender. Stir in broth and rice. Heat to boiling, stirring occasionally; reduce heat to medium-low. Cover and cook 50 to 55 minutes or until rice is tender and most liquid is absorbed; let stand, covered, 5 minutes. Divide wild rice mixture among 4 bowls. 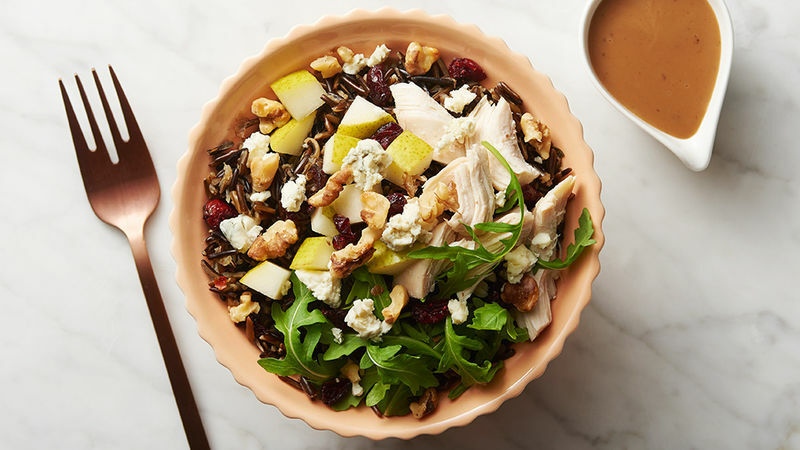 Top with arugula, chicken, pears, blue cheese, walnuts and cranberries. Serve with dressing. Try substituting baby spinach or baby mixed greens for the arugula in this recipe. Different kinds of wild rice cook at different rates and sometimes require slightly more or less liquid. If your wild rice is tender, but there is still liquid in the pan, drain before serving. To toast walnuts, sprinkle in ungreased heavy skillet. Cook over medium heat 5 to 7 minutes, stirring frequently until nuts begin to brown, then stirring constantly until nuts are light brown.